Being a mother is hard work, dressing up my child has been one of the fun parts. Ever since Izzy was an infant I have truly enjoyed picking out her outfits and dressing her everyday. Budgeting for fashion isn’t always as fun and can be difficult. 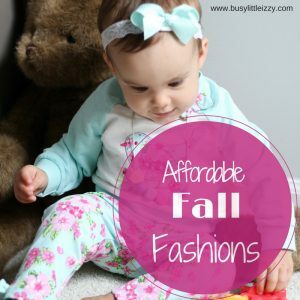 I’m sharing two shops with you that have some adorable fashions for this fall without breaking the bank! This company has fashions for infant-adult. Her shop is growing and full or adorable goodies for every season! Her fall clothing has me way too excited! From pumpkin moccasins to halloween rompers I’m really loving it all. You will find on Instagram the shop owner shares her giveaways and discounts. Go give this shop a follow here so you don’t miss out! 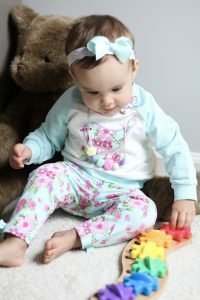 When dressing Izzy for the fall there are days I just love to layer her! In GA is can be hot one day and cool the next or warm during the day and cool by night, especially in the fall. As Izzy models below you will find rompers that are great for now while it’s warmer but can easily be paired with leggings, a long sleeve top or sweater as it gets cooler. After all we want the kids clothes to last as long as possible and through as many seasons as we can right? If you are a Halloween lover then you will love the festive goodies this shop has for your boy(s) or girl(s). Go shop Frogs and Flowers Fashions now by clicking here. Use code: IZZY10 for 10% off your purchase. This company has newborn, baby and toddler sizes. You will find pjs, clothing, swim suits and more. If you are looking for sweet fashions that won’t break the bank I suggest you check them out. I’m so excited to have more days where Izzy can go into sweatshirts and sweatpants! I love the sweatsuit look and it’s pure comfort for her. What girl doesn’t love a little fashion and comfort mixed together? The pjs and sweatsuit shown below were super easy for Izzy to move around & play in which is one of the most important things when it comes to finding her clothes. See Izzy in action below. Go shop Little Me now by clicking here. If you love Instagram, you can also follow Little Me there by clicking here. Love all of these cute outfits. I am so ready for fall! Oh my gosh!!!!! That first outfit and then that bird outfit!!!!! LOVE them! Thank you! We love clothes!!! That sweatsuit is EVERYTHING! So cute!!!! But…please tell me it’s not time for fall yet?!? Haha I’m soooo ready! I can’t handle the GA heat! DYING OVER HERE! This is so cute! Thank you! Yay for shopping! Awe thank you so much ?